The USB-C port on the new iPad Pro is a big deal. Besides charging the device and showing off Apple’s decision to take baby steps away from Lightning, it also allows the iPad to use the wide variety of USB-C dongles and doodads available. On paper it would seem like the USB-C port would allow the iPad Pro to finally make its way into real laptop land by adding useful capabilities like allowing you to plug into hard wired internet or use a monitor and keyboard. And technically it can do those things, just not all at the same time unless you have a USB-C hub. It’s a little more difficult than you would think as the iPad Pro notably supports USB-C, but does not support Thunderbolt 3 with which shares it shares a port design. The majority of available hubs use Thunderbolt 3. So I could plug it into my monitor or my keyboard or ethernet, but I could not use the Thunderbolt 3 hub I currently have all three plugged into. My cheap USB-C hub with Ethernet and USB 3.0 ports worked perfectly when plugged in, but USB-C only hubs aren’t as common or as high quality as Thunderbolt 3 hubs. Using a keyboard with the iPad Pro is wonderful—the Smart Keyboard case is just as expensive as a high-end USB-C keyboard, and not nearly as pleasant to type on. So when you’re sitting at a desk, or even lugging a full-sized keyboard to a coffee shop, that doesn’t feel quite as obnoxious as you’d expect, especially when you plug it into the iPad Pro and it just works. The monitor is another matter. I plugged the iPad Pro into a 4K Dell monitor, and the image on the iPad immediately appeared on my monitor. Then I opened Netflix and the video itself popped up on the big display. Amazing! Then I went to switch to another application, foolishly assuming my Netflix video would continue to play on the larger monitor, rather than just mirroring the iPad. Instead, Netflix closed, and Chrome was now open. Duh! It’s not an extra monitor—it’s just a mirror. And that is annoying. 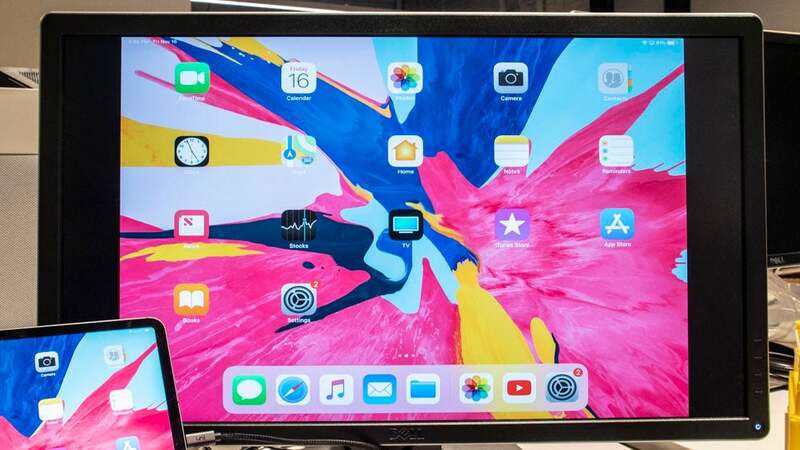 While there are plenty of situations when it’s useful to mirror your smaller display on something larger, not including the option to use an extra display area seems like a missed opportunity. This is among the many quirks that make iOS’ limitations as a productivity platform more apparent, especially compared to Chrome OS and Windows. But there’s one I can’t get over. Windows and Chrome OS support mouse input, iOS does not. When using Chrome and Slack in split-screen mode on the iPad with my nice keyboard and that 4K monitor, I still had to reach for the iPad to, you know, do anything. Switching between apps, navigating Slack. All of it required touch input. On the other hand, there was one magical experience. I took my USB-C card reader, plugged it into the iPad, and it immediately recognised my SD card and offered to import my photos. It was faster smoother than on Windows or macOS. So yes, some aspects of the iPad Pro’s USB-C support are overblown. 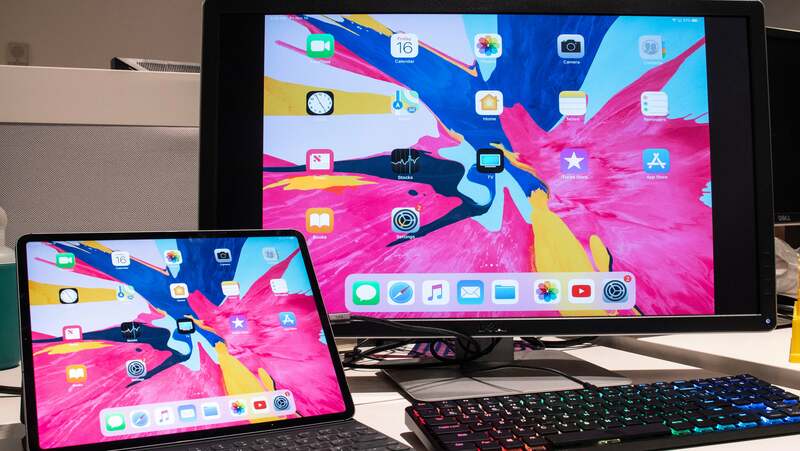 Monitors and hubs don’t work well, and that’s disappointing, But when the iPad Pro does do USB-C right, it’s pretty special and makes me wish Apple would finally, FINALLY, bring mouse support to its touch-based operating system. This is the first iOS product to incorporate USB-C, so I’m not surprised it’s not perfectly implemented. We can only hope that Apple’s serious about the promise of USB-C and will keep improving how it works on its tablets.